The CSTA Canadian Sport Event of the Year Award recognizes the overall success of an outstanding single-sport, multi-sport or collegiate event held in Canada in 2018. 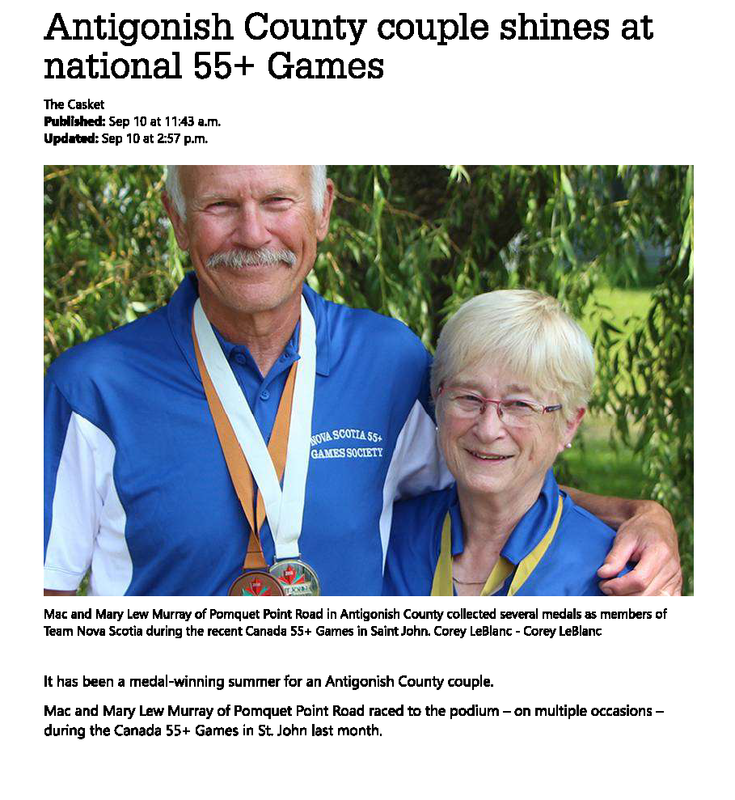 The 2018 Canada 55 plus Games celebrated healthy living – and also brought together various senior clubs, centers, and accommodation providers throughout Saint John. 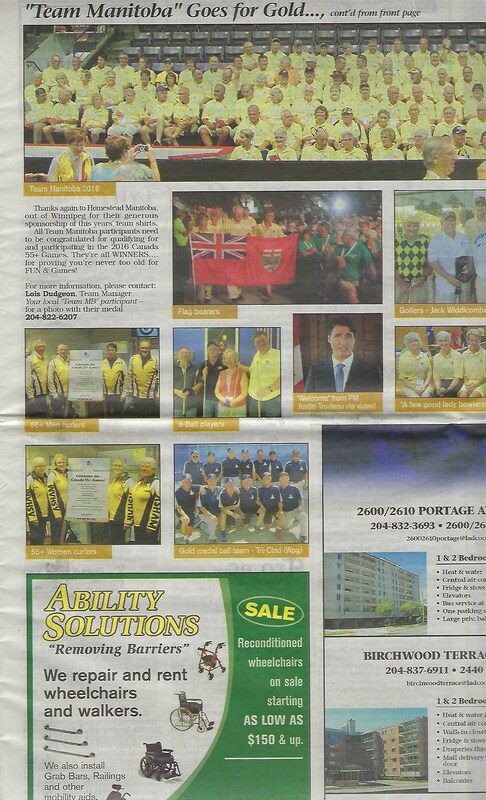 Targeting 55+ aged volunteers was a success and raised awareness of sporting opportunities for the 55+ community, inspiring many to compete provincially and nationally at future events, as well as to become officials. Local retailers, restaurants and hotels created incentive programs for the 2300 participants, hosted specials for different teams and ensured the games spirit was felt throughout the city. The legacy of the event can be seen in improved facilities, funds donated to help seniors stay active, and growing the awareness of the Games for the future. The PRESTIGE Awards are the CSTA’s marquis Program Recognizing Exceptional Sport Tourism Initiatives, Games & Events. In its 13th year, this annual award program shines a spotlight on the dynamic Canadians, places and events that are building our nation’s growing sport tourism industry. The Canadian Sport Tourism Alliance is a non-governmental, member-based, capacity building organization that promotes sport tourism as a grassroots economic development initiative at the community level. The CSTA services over 500 members across Canada, including 130 municipalities, 300 national and provincial sport, multi-sport and major games organizations and a variety of other sport and tourism industry partners. Sport tourism is the fastest growing segment of the tourism industry in Canada with over $6.8 billion in annual spending by domestic and international visitors. Our 2019 Spring Newsletter is now available. Click the image below to view. We are very pleased to advise you that the 2018 Games in Saint John have been selected as a finalist for the CSTA Sport event of the Year Award for Canada and Barb Curry the co-chair of the Games has been nominated as a finalist in the Volunteer of the Year Award category. CSTA (Canadian Sport Tourism Alliance) is the umbrella organization for the sport tourism industry and this will be the 13th year these awards have been presented. The actual selection will be announced at their annual Sport Events Congress to be held in Ottawa on March 20th. 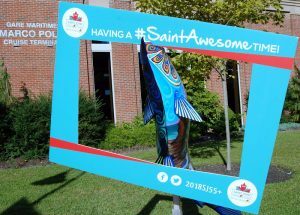 Click here to go to the Saint John 2018 Results Page. Click here to go to our Photo Albums. 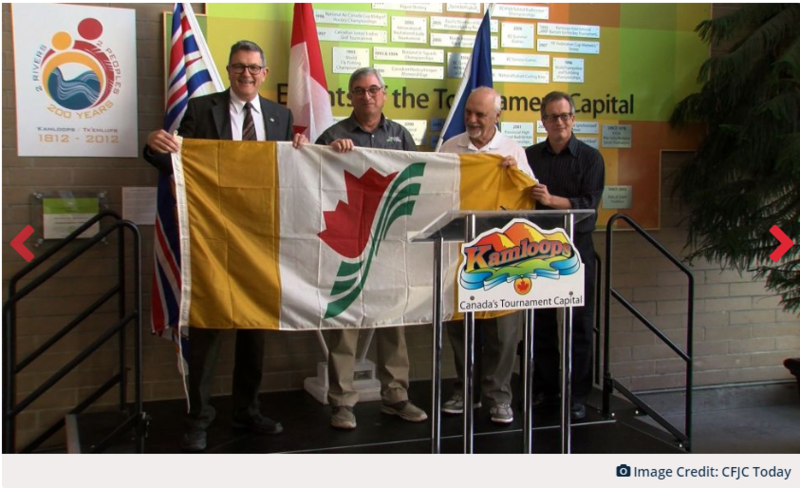 Seen from left to right are Kamloops Mayor Ken Christian, Kamloops 2020 Board Chair Henry Pejril, CSGA President Gordon Oates and CSGA Coordinator John Gregory at the October 16, 2018 meeting to officially hand over the 2020 Canada 55+ Games Flag to the City of Kamloops. 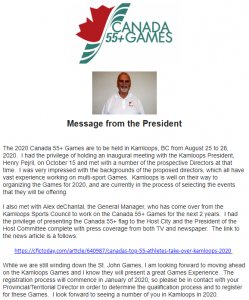 It is my pleasure to announce that the 55+ BC Games Board of Directors at their meeting on September 12, 2018 appointed Linda Meise as their representative to the Canadian Senior Games Association as their representative effective immediately. John, can you make the necessary changes to the website for this item. Coach Shannon Read, left, and Masters level athlete Anne Murray cool off in Murray’s New Minas pool one sunny day recently. Murray shows her excitement while at the World Masters Games in Aukland, New Zealand this past April. Competing in the sprinting component of track and field, she reached the finals, placing fourth in the 200-metre sprint and sixth in the 100-metre run. “I have received over 30 medals over the last six years in my age group,” she said, which is women aged 60 – 65. Her personal experience started with the 55+ games back in 2011 when they were held in the Valley. Winning five silver medals and full of convert’s enthusiasm, the Kingstec faculty member went on to compete in three provincial games. Murray qualified for nationals, which were held in Cape Breton in 2012, Alberta in 2014 and Brampton, Ont. in 2016. 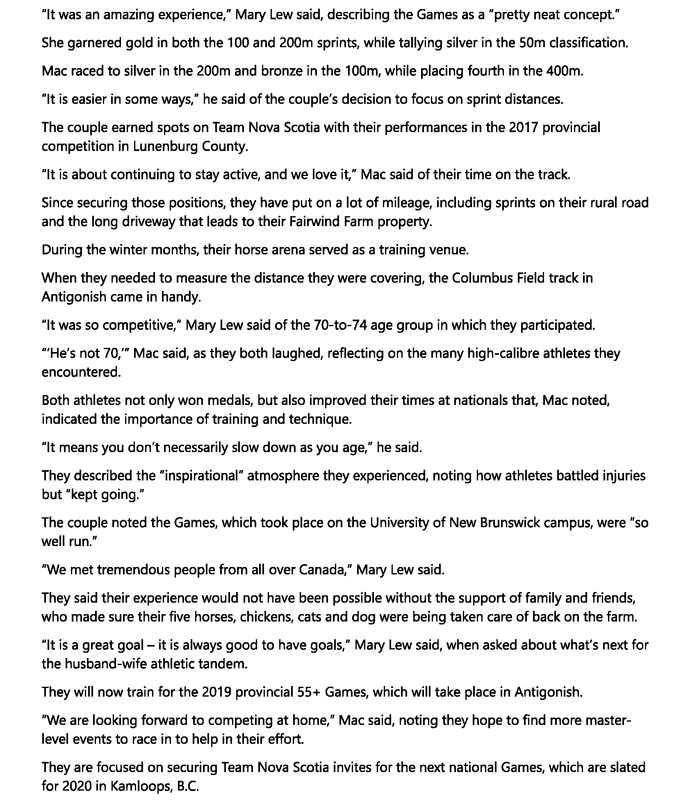 Along the way she met fellow Masters level athletes from Nova Scotia, like Llew Chase and Alice Patrick, and two Cape Breton athletes, Georgie Gill and Colleen McEachern, who all inspired her. “Some of them have won national records,” she noted of individual athletes who have become friends. The two met in 2010 when Read was recreation director in Wolfville. A National Coaching Certification Program-qualified coach, she wanted to encourage more triathlon participants by starting a club. Hoping to reduce her blood pressure, Murray saw the sport as a means to get healthier in a supportive atmosphere. At the age of 58 she took part in her first Just for Fun Triathlon. She found the wide range of ages, abilities and the social atmosphere attractive. Furthermore after six months with the club, her blood pressure, cholesterol, weight and resting pulse were all lower. She has adopted the three disciplines of the sport – swimming, biking and running. Running is where Murray acknowledges she is most comfortable. She looks back on her early teenage years when she ran hard in track and field. Biking was the new sport she added. Her preference is to take each aspect of triathlon separately. Last year Murray hired Read as a trainer before she set out for nationals and worlds. Murray is grateful that she has been able to have incredible experiences in training and participating in these events. Read, who is 57, is training for the International Triathlon Union (ITU) Multisport World Championship Festival in Penticton, B.C. this coming week. 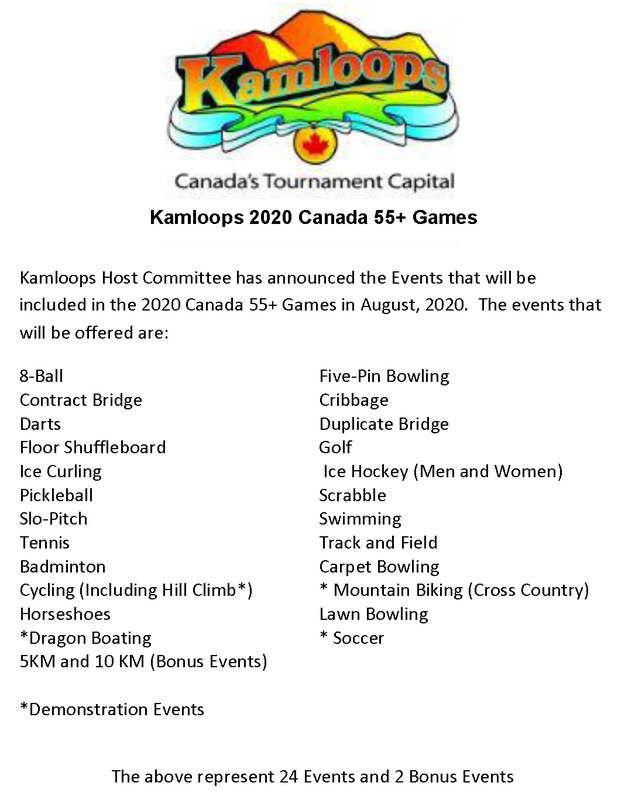 It runs until Aug. 27 and the massive 10-day celebration will see athletes from all over the world vying for four different multisport titles. They include: duathilon, long distance triathlon, aquathon and cross triathlon. Read firmly believes that training is important as we get older, especially in terms of balance, strength and range of motion. “I think it’s really exciting if you can manage the stiffness of aging,” she says. Read thinks the multisport model helps. 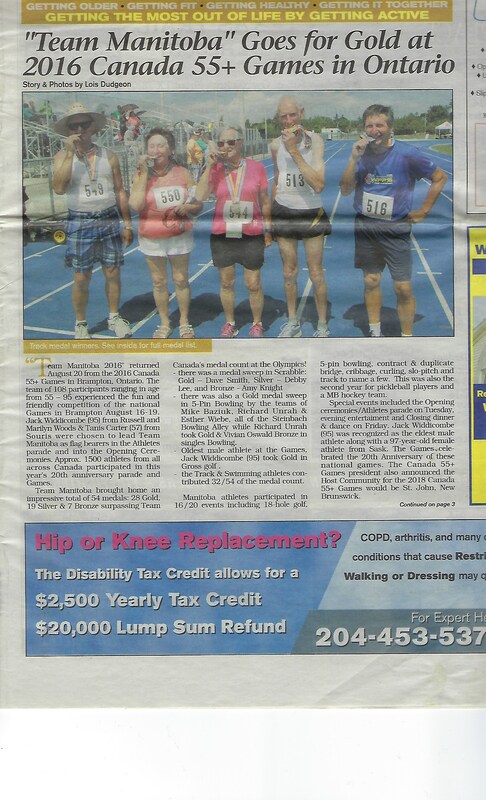 That’s why she is involved with the Blomidon Multisport Club locally. Swimming and biking at Aylesford Lake works well for training, she noted, now that the road is paved. Lifeguards being on duty are another advantage, Read adds.